Peterborough looks set to get its first vegan restaurant over the summer. It has been a long time coming, but When Polly Met Fergie is currently taking shape in a former shop unit in the Westgate Arcade, with mid August the proposed opening date. The man behind the venture is confirmed vegan Alastair Norwell and his partner Paula, who first set the ball rolling 12 months ago - but only got the go-ahead to start work two weeks ago. “It has been a slow process, but we had spent money on the planning side of things and loved the location so we weren’t going to be put off by the delays,” said Alastair, pictured outside the unit, who says the name was inspired by his dogs. The venue will be split over two floors with the vegan restaurant , seating around 30, on the ground floor and a jazz cocktail bar, seating 70, upstairs. “Downstairs, the feel will be ‘Parisian cafe’, while upstairs the aim is to create a smoky New York jazz bar feel, without the smoke,” he said. “ We want people to be relaxed and entertained, and have their drinks served to them while they listen to the music and chat with friends. 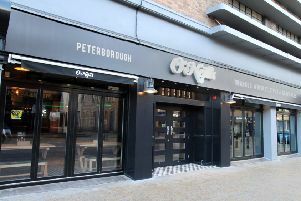 Alastair will be in charge of the kitchen, providing vegan fare which, he says, is something lacking from Peterborough’s eating out scene despite its growing popularity. Expect dishes such as eggless benedict, scrambled ackee, fresh pasta including ravioli and Southern fried chickenless. He said the music played will be mostly jazz, with artists appearing when possible, not just recorded music. “Peterborough Jazz Club does very well and has recently moved to The Broadway suite. We hope to add to that and make a stronger jazz scene in the city,” added Alastair.